Over the years I have had some interesting experiences with small portable outdoor grills, especially during my first years camping. (read here about my roadtrip fire) While it's likely that you clean your grill after each use, it's still important that you do a thorough cleaning of your outdoor grill regularly to help remove grime and food that's fallen into the grill so that your grill will continue to cook evenly and last a long time. I have also found that if you store your small grill in a storage bay during humid summer conditions, bold can grow where droppings and burnt food is still left on the burner covers. 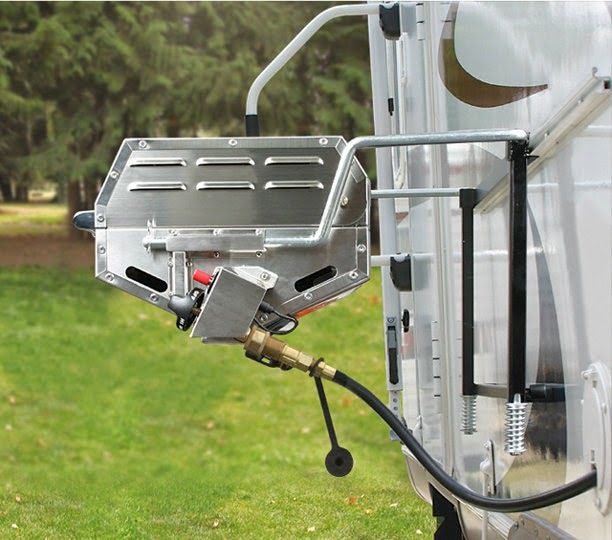 In order for your grill to be ready to use at any time, it's important that you become familiar with the steps involved with cleaning your grill so that you can cook while on the road with your RV. If you own a gas grill, it's essential that you disconnect the gas as a precaution. Ensuring that the grill isn't hot is also important since it will allow you to deep clean the grill without the concern of being burned. You will want to remove the grill grate and burner cover(s) or sometimes called smoker plates to allow for complete cleaning of those components as well as the burners. Owning a wire brush that is designed for use with grills can help make it easy to remove any thick particles that have attached to the grill grate and burner covers. This will help ensure that any solid pieces are removed before you move on to the next step. Mixing up a soapy water solution with 3-4 drops of dish detergent per 1/2 gallon of water will help thoroughly clean your grill removing any grease left behind. It's important that you avoid harsh chemicals that could be dangerous for consumption since it may end up resulting in your grill being unhealthy to eat from. Ensure the burner holes are all open and unobstructed for nice even cooking of food. Be sure to rinse all components with fresh water and reassemble as you go. Once clean, light the grill and let it run for 5 minutes ensuring any soapy residue that was left behind is completely burned off. Add a very light coating of vegetable oil to the grill grate to keep it from rusting while in storage. By cleaning your grill after each use and performing a deep clean regularly, you can ensure that your outdoor grill cooks evenly and is ready to be used at any time. If you're interested in outdoor grills check out our selection online or for questions please contact us.